OK, this one is Slap the drummer's idea. He was thinking about using Manfred's HH control box and having Hi Hat cymbals on the left and right sides of the kit. I already have Hi Hats on both sides of my kit, but since I have 2 Drumit Five modules I have used the A module for my main standard (left side) Hi Hat and used the B module with my stationary Hi Hat on the right side of my kit using fixed Hi Hat dsnd's for my right side stationary HH. After discussing Slap's idea for HH's on both sides of the kit using one HH input I decided to try it. In the pics you will see the splitter I put in the Cymbal side of Manfred's box. From that .... one TRS cable goes to the main HH cymbal and one goes to the other HH cymbal on the right side of my kit. It works well. I can control the HH open/closed transitions from the one pedal for both cymbals. My main HH on the stand moves like always, the stationary hat does not move up/down physically, but the sounds do respond to the HH control pedal. What that means is I now have one more input open to add my Stacked cymbal to the setup. One little tidbit. If anyone uses 2 Drumit Five modules like me and decides to add a crash to a Hi Hat input instead of using it for a standard Hi Hat ...... If you plug a regular Piezo/Switch cymbal into the Hi Hat input you will only get 1 zone .... but if you use a Manfred HH box along with ..... and plug a Piezo/Switch cymbal into the Box and box into the module you will get 2 zones .... Bow and Edge sounds, no choke but both zones. The dsnds must have bow and edge sounds already in them if you want both zones, but it does work. If you connect the "Manfred box" to one of your hihat input, perhaps it could work under the bass drum pedal, so you could use opened or closed sounds on the kick (with a special Dsnd file)? Manfred/JMan, do you think there is a way to use the hi hat input as a dual zone piezo/switch cymbal without using one of your circuits? Is the hall sensor really necessary, or could there be a resistor added to a cable or something that would solve the issue? The value of the 820R resistor shouldn't be that critical. You can also try 1k instead. Looks like I can make this inline after all, and shouldn't be too hard! Am off to get some resistors. right of the kit without using up extra inputs. (Just wire L and R channel of each cymbal back to L and R on the input jack). BUT - does anybody know, is it possible to split out a Cymbal input into 2 mono zones? The cymbals are piezo/switch, which don't lend themselves to being split - at least, not elegantly. The switch means that you will only get a single velocity and even then that's an issue. Piezo/switch combos work by "toggling" the sound based on the switch being depressed (always found that funny), and the velocity from the piezo. If the piezo gets a hit without the switch being down, it plays the bow. 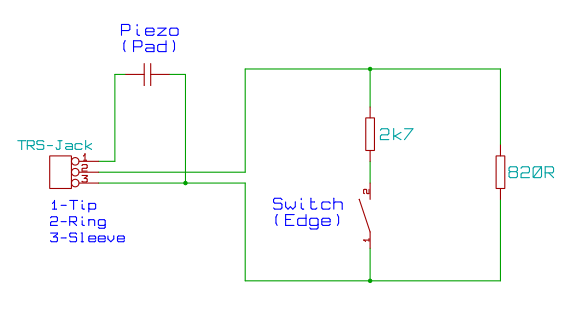 If the piezo gets a hit and the switch is down, it plays the rim. Same idea for three zone cymbals (at least, with Roland they do. As far as I can tell, 2Box modules do some weird stuff to make their cymbals three "zone". It appears they just trigger the bell after a certain velocity, but I can't really be sure about that since I'm only using Rolands and have never tried a 2Box cymbal).